VOCAL’s Digital Network Echo Canceller software is designed to cancel electrical echoes observed in devices associated with long distance telephone communications. Echoes significantly degrade the quality of a conversation. They also affect the ability to successfully transmit voiceband data, fax and text messages. Our Line & Network echo cancellation solution not only meets but exceeds the echo cancellation performance as laid out by ITU. Contact us to discuss your specific echo cancellation application requirements. VOCAL’s Digital Network Echo Canceller source code is optimized for DSPs and conventional processors from TI, ADI, Intel, ARM and other leading vendors. Our extensive experience in signal processing and communications enables our Line & Network echo cancellation solution to exceed the ITU G.168 recommendation. Custom solutions are also available. Electrical echoes occur from hybrids in the telephony device or in the network and are a result of 2 to 4 wire conversions. The ITU G.168 Recommendation provides a target for achievement of echo cancellers in these environments. G.168 is not a bit-exact standard; it provides only guidelines and achievements that an echo canceller should meet. An echo canceller must have rapid convergence, while preventing divergence due to doubletalk, and be able to correctly deal with fax and low speed data transmissions. Line and network echoes can occur for the same reason, but can have different characteristics. Line echo cancellation software works in the same device as the hybrid that causes the echo, whereas network echo cancellation software works in devices but the echo source occurs elsewhere in the network. Thus, the network echo situation has challenges not present in the line echo situation. 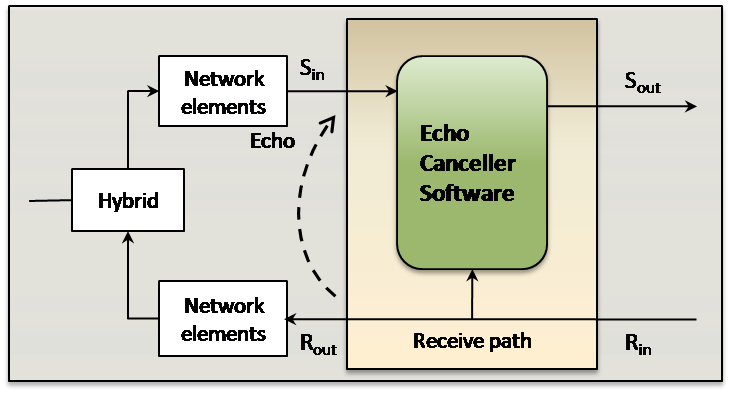 A network echo canceller works in the digital portion of a VoIP network which has no leakage and does not directly introduce echo. However VoIP networks have additional delays due to the encoding and decoding processes, including packetization, packet switching, and jitter buffer delays. The round-trip in VoIP networks can easily be on the order of 100ms. When the round-trip delay is 25ms or less, the echo is imperceptible, and the user cannot differentiate the originating speech and the returning echo as separate events. Also, there may be more than one hybrid in the network. A network echo canceller must be able to handle multiple reflections effectively. Alternatively, a network may have other echo cancellers in the network that already cancel the echoes, and there is no returning echo. ITU G.168 refers to this situation as tandem operation, and a network echo canceller must be able to handle the existence of multiple reflections or no perceived reflections. 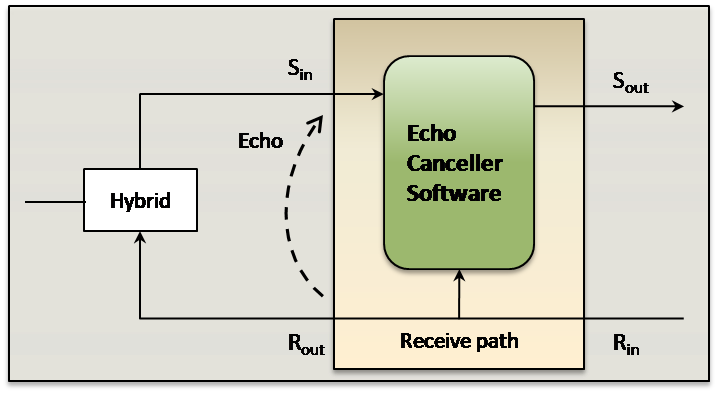 An additional challenge presented by having network elements in between the echo cancellation software and the source of the echo is that vocoders can exist in the echo path. Vocoders transform the echo often introducing non-linearities and further delays. A high quality echo canceller must be able to handle this scenario effectively. VOCAL’s software is available for the following platforms. Please contact us for specific Digital Network Echo Canceller supported platforms.